This pottery shaving bowl is handmade and crafted in the USA. The green bowl is hand-thrown and altered while on the wheel. Each bowl has a swirl pattern on the bottom & pulled indentations on the sides to aid in lathering and grip. The glaze is a gorgeous jade green. The bowl measures a little under 3 inches high and 4 inches wide. This ceramic bowl is a functional piece and is dishwasher and microwave safe. The brush and soap puck are not included. 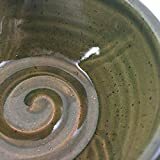 If you are interested in shaving bowls in other colors, such as blue, purple and white, type JaysClay into the Amazon search bar and you will see the other items available. This green bowl is a functional piece and is dishwasher and microwave safe. This and all of JaysClay products are made completely in the USA.